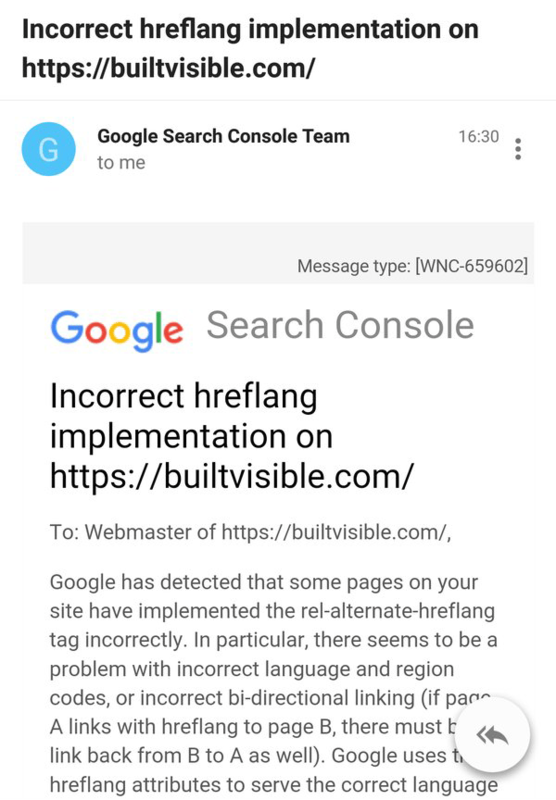 Yesterday, it seems Google has sent out a surge in "Incorrect Hreflang Implementation" notifications via the Google Search Console. The first time we saw this message was back in July 2015 and since, we haven't seen many - that is until yesterday. Yesterday, the Google Webmaster Forums filled up with dozens and dozens of webmasters about this notification. I can't even link to them all. We even have tons of posts on Twitter including from @gfiorelli1, @richardbaxter and @Marie_Haynes amongst others. The thing is, many are saying the notification is wrong. But when questioned about it being wrong, Google's John Mueller said on Twitter that it is time to fix things. @Marie_Haynes Time to fix things :). So I would check your Google Search Console message area to make sure you do not have any of these errors. It should only apply to international sites that deploy ahref lang. Forum discussion at Google Webmaster Forums & many more.